The Boston Witham Academies Federation (BWAF) is commencing a consultation process on the proposal to permanently expand the capacity at Haven High Academy within the federation with an implementation date of September 2018. The Local Authority (LA) has a statutory duty to ensure that there are sufficient places to accommodate all pupils of school age in Lincolnshire. The Local Authority has been working with primary providers across Boston, including BWAF, to increase the number of school places available to meet growing demand. Over the past five years the Local Authority has invested significant funding into local primary schools, adding over 760 extra primary places. The opening of the Boston Pioneers Free School Academy has provided the capacity for a further 420 Boston Primary School places. This tremendous growth in primary pupil numbers will progress into the secondary sector from September 2018. As a consequence the LA are fully supportive of Haven High Academy’s proposal to increase their capacity to help meet the needs of the local community. Additional places at Haven High Academy will contribute to ensuring that sufficient school places are available in Boston to meet future demand. It is important that BWAF gathers and considers all views on this proposal prior to making a decision on whether to proceed. The proposal being consulted on is to permanently expand the school from the existing capacity of 1025 places based on a Published Admission Number (PAN) of 205 to 1,275 places (PAN 255), with a proposed implementation date of September 2018. The following information outlines the reasons for the proposal and explains why there is a need to expand this school and how the expansion can benefit the children and the community. Having additional classes and more children on roll at the academy will also have financial and organisational benefits for the school. The academy has the ability to accommodate additional students (an increase of 50 students in each year group commencing September 2018 for Year 7 pupils, through to September 2022 when the additional capacity will be in place for all year groups) through utilising the Tollfield Road Campus for one distinct lower school Year 7 group. This site, with the full range of specialist secondary curriculum accommodation and state of the art resources, currently accommodates post 16 learners through subcontracting arrangements – due to end in August 2018. As a consequence no additional building work is required and Haven High Academy will continue to operate across two, town centred, sites. In addition this may potentially provide the opportunity to enhance teaching provision and career opportunities for staff which in turn will benefit the learning experience of the children. If you wish to comment on this proposal then please return the response form by 5.00pm on Wednesday 19th July 2017 using the contact details provided at the head of this letter. Haven High Academy Sports Faculty organised and conducted another successful PGL Netball Tour to Liddington, Swindon. 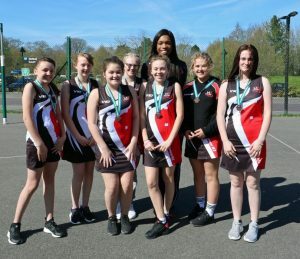 The tournament itself was organised and officiated by England Netball, with the students gaining the best possible game play and umpiring experiences with many receiving individualised coaching from the England officials. Three teams in total attended the weekend comprising of Year 7 / Year 8 and Year 9 students. During the student’s spare time they were provided the opportunity of experiencing outdoor adventure activities like climbing, Zip wire, Jacobs ladder and many more. All Haven High teams consistently displayed effort, determination and positive game results over the weekend and benefitted hugely from the experience offered from this Netball Tour. Our Year 9 team worked their way through to the semi-finals and achieved 3rd place overall within their age category. They were presented their medals by England professional Eboni Beckford-Chambers.